A2600 Dodge 'Em (USA) in 00:52.94 by Yep2yel & morningpee. 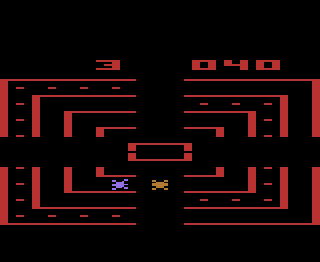 In Dodge 'Em (1980), you control a race car on a four lane track, and your goal is to collect all of the dots in order to earn points and advance to the next level. The race track is divided into four quadrants with a break in the lanes between them, and you can change lanes only within these breaks. A second car will travel in the opposite direction and try to get into your lane and crash you, so you need to make sure you switch to any lane it isn't in! You can travel at two different speeds (fast and slow) and even have a second player control the enemy car. In this mesmerizing movie, yep2yel and morningpee speed around the track and beat the first round of the game in under 55 seconds. In doing so, they improve the previous movie by 11.28 seconds thanks to new routes and speed tricks.